Bloomfield Village covers an area of approximately one square mile from Quarton Road on the north to Maple Road on the south and from Lahser Road on the west to the City of Birmingham on the east. There are nearly 1,000 homes in the Village. Mr. Judson Bradway established Bloomfield Village in 1924 as a nonpolitical entity within Bloomfield Township in Oakland County. He maintained control of architectural plans and maintenance of the Village through 1966. Area residents formed the Bloomfield Village Protective Association at the beginning of World War II as a civilian defense measure to provide fire and police protection. The Association incorporated in April 1942 as a nonprofit Michigan corporation. 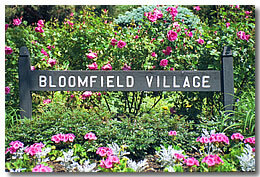 On May 11, 1966, the name was changed to Bloomfield Village Association at which time the Association also assumed responsibility for the enforcement of the recorded Building and Use Restrictions and administration of the Maintenance Fund. As a Bloomfield Village resident, you automatically are a member of the Bloomfield Village Association, which is administered by its Board of Trustees. You are, therefore, entitled to all its benefits and bound by its covenants, found in the restriction agreement for your subdivision, a copy of which you should have received when you purchased your property. October is Fire Safety Month, so the Bloomfield Village Volunteer Fire Department held its annual open house on Oct. 4. The event was held in cooperation with Bloomfield Township Fire Department. Kids could have pictures taken with a fire fighter, spray water and learn what to do in a fire inside the simulated smoke house. It was also a great opportunity for everyone to explore the inside of a fire truck, police car and see the Township’s Special Operations and Rescue Truck (SOAR). The SOAR truck is a modified beverage delivery truck retro fitted with everything the fire department needs at a fire, hazardous materials spill, vehicle accident, or building collapse. Volunteers served doughnuts and apple cider. Retired Fire Chief Harvey Rosenberg grilled hot dogs for the crowd. After a four-year-old informed him that he was burning the hot dogs, he fine tuned his cooking skills. Adults also enjoyed the open house. Mr. Dady stopped by the open house with his father’s BVFD fire hat. He was able to locate his dad in a photograph from the 50s standing in front of the Bloomfield Village Fire Hall, which was later renamed Hackett Hall. The village Fire Department is compromised of 12 volunteers, 4 advisors, 2 provisional volunteers and one paid deputy chief. We’re always looking for new members to join the department. If interested, call…..D. Fire Chief Ted Gauthier for more information at (248) 645-8285.